The SonaVERSE USB 2.0-channel speaker system is equipped with 2 high-excursion drivers for full range stereo sound. Listen to music and watch movies without the dull audio experience from your computer's built-in speakers. Designed to be ultra-portable, this speaker is perfect for video conferencing on the road, watching movies with the kids or for setting up a work station on the move. 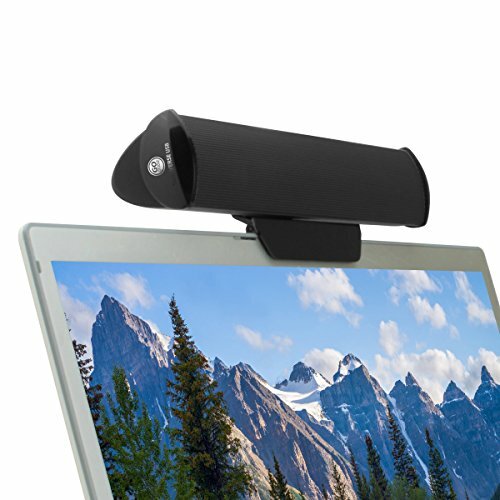 The clip-on mount can attach directly to any laptop screen that is 1/2 inch thick or less. The padded grips prevent any scratching & ensure the speaker stays put. If you prefer a free standing option, use the included mount to prop the speaker up either horizontally or vertically. Both the clip and stand are removable so you can customize the speaker's setup. No extra adapters are required for this compact setup. Simply plug the cable into USB port, adjust the volume and you are ready to start listening.